Myth — Cash on the sidelines is bullish for stocks. This refrain rang like a gong all the way through the declines of 2000-2002 and 2007-2009. In February 2000, when mutual fund cash hit 4.2% (compared to 3.8% in November), The Elliott Wave Financial Forecast issued its “cash is king” advice. Once again, the word on the street is that there is way too much “cash on the sidelines” for stocks to fall precipitously. 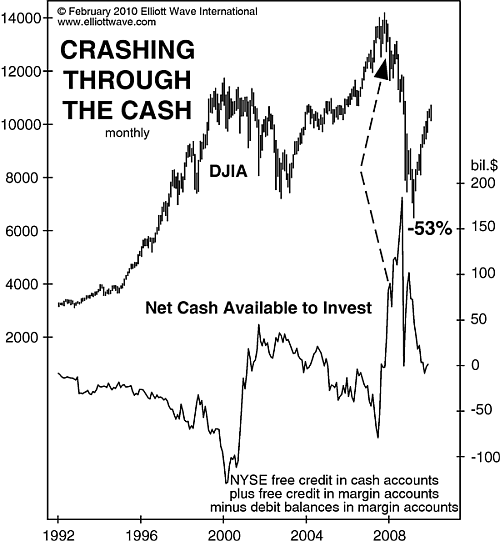 This chart shows net cash available to investors plotted beneath the DJIA. In December 2007, available net cash expanded to a new high, besting all extremes since at least 1992, a 15-year time span. Despite the presence of this mountain of cash, the DJIA lost more than half its entire value over the next 15 months. Indeed, as the chart shows, cash remained high right as the stock market entered the most intense part of the crash in 2008. Available cash does correlate with the market’s moves, but the market is in charge, not the cash. We’ve gathered the writings that expose these 10 statements as market myths in our 33-page eBook, called Market Myths Exposed. They come from two of our premier publications, The Elliott Wave Theorist and The Elliott Wave Financial Forecast, as well as two of our books, Prechter’s Perspective and The Wave Principle of Human Social Behavior. The 33-page eBook takes the 10 most dangerous investment myths head on and exposes the truth about each in a way every investor can understand. You will uncover important myths about diversifying your portfolio, the safety of your bank deposits, earnings reports, investment bubbles, inflation and deflation, small stocks, speculation, and more! Learn more, and get your free eBook here.